Cyprus, the third largest island of the Mediterranean Sea, is located south of Turkey. The island was conquered by the Ottoman (Turkish) Empire in 1571 and remained under Ottoman rule for three centuries. Cyprus came under British rule in 1878 following the Russo-Turkish War. After 82 years of British rule the island became an independent republic in 1960 under a constitution drafted in an effort to balance the interests of Greek and Turkish Cypriots. Britain retained sovereignty over two large military bases, Akrotíri and Dhekelia, on the south coast. Unfortunately the political compromise dissolved into violence in 1974. Turkish troops intervened and occupied the northern third of Cyprus, establishing the Turkish Republic of Northern Cyprus. United Nations troops administer the Buffer Zone, commonly called the Green Line, a narrow zone separating the Greek and Turkish sections of the island. The Turkish Republic is not recognized diplomatically by any country except Turkey. 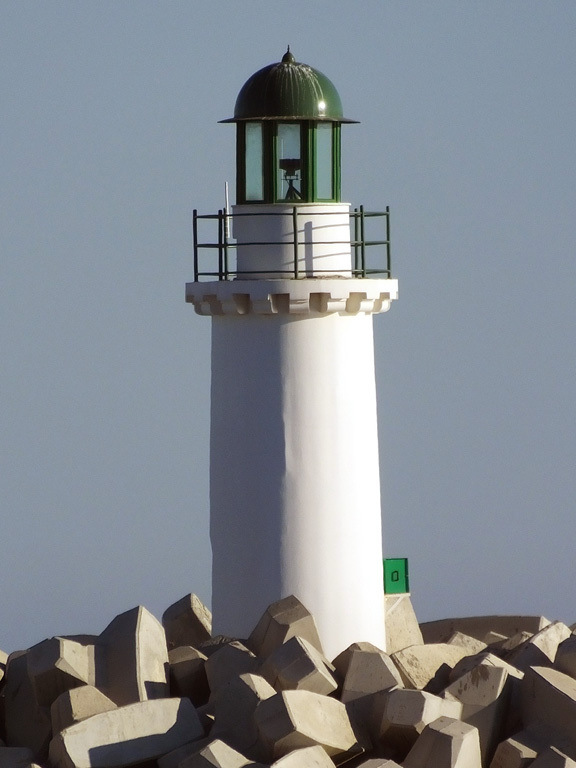 Lighthouses in the (Greek) Republic of Cyprus are maintained by the Cyprus Ports Authority. The Greek word for a lighthouse, pháros or fáros (φάρος), is the root for the words in many Western European languages. In Greek nisis is an island, akra is a cape or headland, and kolpós is a bay or gulf. In Cyprus, the word kávo (κάβο) is also used for a cape. ARLHS numbers are from the ARLHS World List of Lights. Admiralty numbers are from volume N of the Admiralty List of Lights & Fog Signals. U.S. NGA List numbers are from Publication 113. 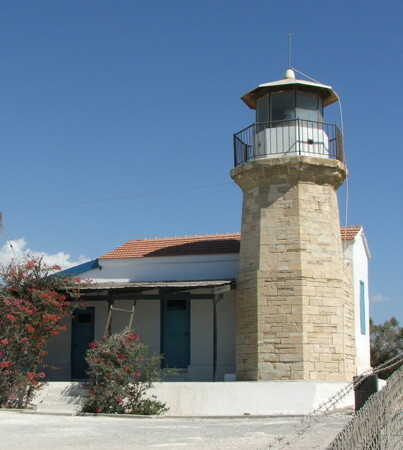 A description of the history of Cyprus lighthouses, illustrated with several small photos. Pages for three of the lighthouses posted by Claudia & Mike Hovorka. Photos by various photographers posted by Alexander Trabas. Many of the Cyprus photos are by Capt. Peter Mosselberger. Navigation chart information for Cyprus. 1892. Active; focal plane 16 m (52 ft); one long (1.5 s) white flash every 15 s. 15 m (49 ft) round masonry tower with lantern and gallery. Entire lighthouse painted white. Trabas has a photo, the Hovorkas have a distant photo, a 2017 photo is available, and Google has a satellite view. Cape Greco, the southeastern tip of Cyprus, is at the end of a long, slender peninsula. Located about 8 km (5 mi) southeast of Ayia Napa. Site and tower closed but it is possible to view the light station from a distance. ARLHS CYP-003; Admiralty N5888; NGA 20940. Date unknown (station established by the Ottoman government in 1864). Active; focal plane 20 m (66 ft); three white flashes every 15 s. 8 m (26 ft) octagonal stone tower with lantern and gallery, attached to one corner of a 1-story masonry keeper's house. The tower is unpainted; lantern painted white. A photo is at right, Maik Schneider has a 2015 photo, Marcel Berendsen has another closeup, Michal Štourač has a 2017 street view, and a Google has a satellite view. The Hovorkas found the lighthouse under renovation in 2005. The original light was shown on a mast atop a white house, and that light was still listed in 1909. Located on a promontory at Kiti, about 12 km (7.5 mi) south of Lárnaka in the village of Pervólia. Site open, tower closed. ARLHS CYP-004; Admiralty N5882; NGA 20904. 2013. Active; focal plane about 8 m (26 ft); flash every 15 s, white or green depending on direction. Approx. 6 m (20 ft) round cylindrical fiberglass (?) tower with lantern and gallery. The tower is white, lantern green. Trabas has Capt. Peter's photo, Vadim Mirushchenko has a photo, and Google has a satellite view. Located at the end of the main breakwater of the New Marina at Lemesós (Limassol). Site open, tower closed. Admiralty N5879.1. 2014. Active; focal plane about 18 m (59 ft); green light occulting once every 5 s. Approx. 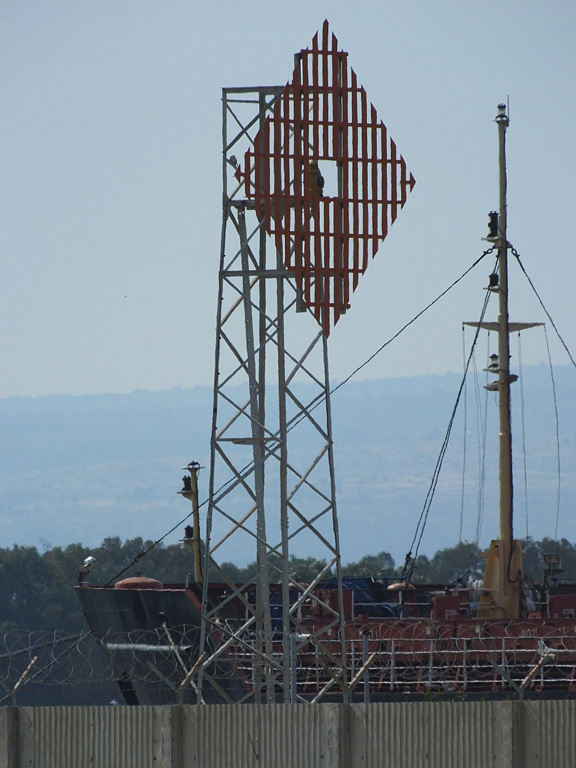 15 m (49 ft) square skeletal tower carrying a diamond-shaped slatted daymark; daymark painted orange. Trabas has Capt. Peter's photo, and Google has an indistinct satellite view. This tower replaced a tower listed with a focal plane of 12 m (39 ft). The front light is on a similar but much shorter tower. Located in a wetlands area southwest of the commercial harbor of Lemesós. Site open, tower closed. Admiralty N5878.1; NGA 20896. 1864 (Ottoman). Inactive. 8 m (26 ft) octagonal cylindrical masonry tower with lantern and gallery, attached to a 1-story masonry keeper's house. The lighthouse was originally painted white. Endangered by lack of maintenance. 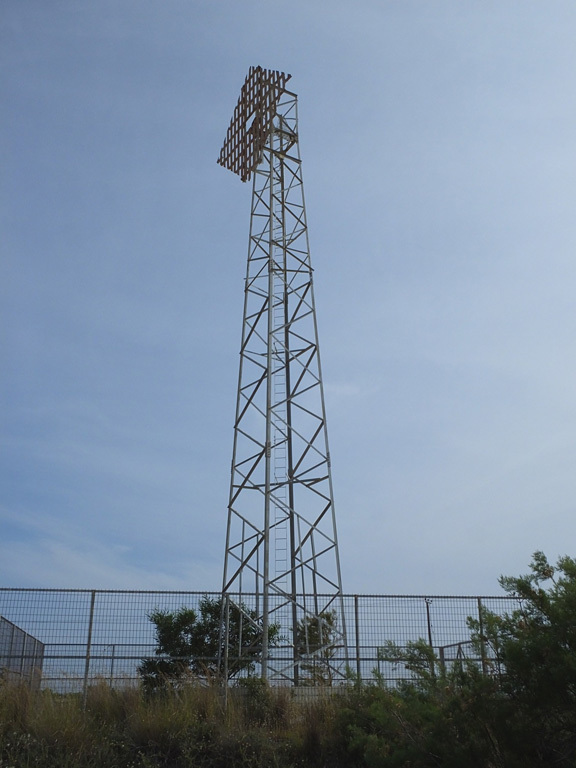 A photo and a second photo on Mapio.net show the lighthouse in very poor condition, but the second photo shows solar panels for the light. Dennis Thompson also has a photo, and Joni McFarland-Johnston has a distant view from the sea. Google's satellite view shows the active light (focal plane 58 m (190 ft); white flash every 5 s) on the southeast side of the historic lighthouse. We need more information on the status of this historic lighthouse. 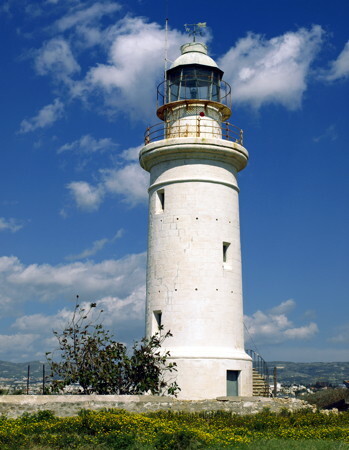 The lighthouse stands on the southernmost tip of Cyprus within the British military base of Akrotíri. Located on the point of the cape, about 8 km (5 mi) southeast of Akrotíri and 20 km (13 mi) south of the city of Lemesós (Limassol). Site status unknown. ARLHS CYP-002. Active light: Admiralty N5876; NGA 20856. 1888. Active; focal plane 36 m (118 ft); one long (1.5 s) white flash every 15 s. 20 m (66 ft) round stone tower with lantern and gallery. Entire lighthouse painted white. The lighthouse stands next to a second century Roman amphitheater, part of which is seen a 2004 photo. Marko Forsten's photo is at the top of this page, Dave Gunn has a photo, the Hovorkas have photos, Jean-Philippe Hebrard has a 2016 photo, Trabas has a photo by Rainer Arndt, Huelse has a historic postcard view, Anton Gladikov has a street view, and Google has a satellite view. 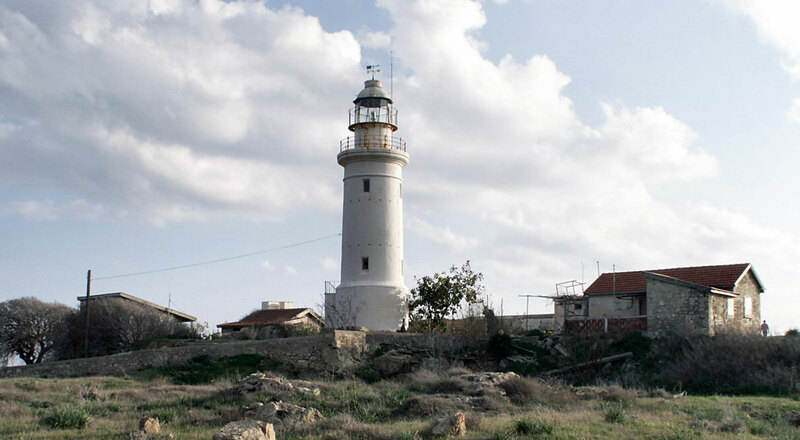 This handsome British Imperial tower is the best known and most visited lighthouse of Cyprus. Páfos is at the southwestern corner of the island, where the lighthouse served as the landfall light for ships arriving from Britain. Located on a promontory projecting into the Mediterranean at Paphos. Site open, tower closed. ARLHS CYP-005; Admiralty N5908; NGA 20836. 1989. Active; focal plane 211 m (692 ft); two white flashes every 15 s. 4.5 m (15 ft) light mounted at one corner of a 1-story stone building (a former British Army observation post). 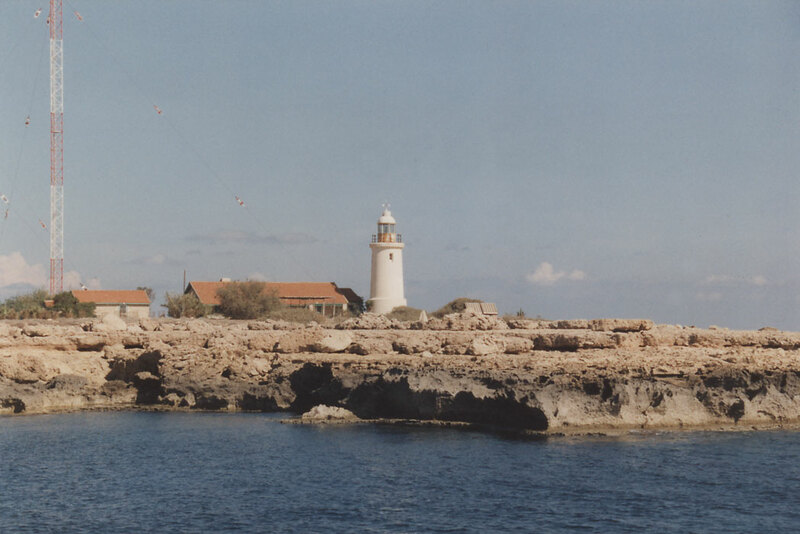 Lightphotos.net has a closeup photo, ARLHS has a photo, qsl.net has a portfolio of photos by amateur radio operator 5B8AP, Markos Kyriacou has a more distant view, and Google has a satellite view. Located atop the bluff at the westernmost tip of Cyprus, about 80 km (50 mi) north northwest of Paphos. Accessible by a long hike or a rough ride by 4x4 vehicle. Site open, building closed. Site manager: Akamas Peninsula National Park. ARLHS CYP-001; Admiralty N5907.6; NGA 20986. Posted May 14, 2007. Checked and revised March 27, 2019. Lighthouses: 7. Site copyright 2019 Russ Rowlett and the University of North Carolina at Chapel Hill.